Religion or politics is created for the divide and rule principle. What you witnessed was not religious more a humanitarian act between human beings. I used to work with muslim people a long time back and to be honest they were human beings just like me. Now take a population of green and purple aliens from outer space. A politician will tell you green is good, purple is bad or vice versa what everybody fails to notice or seems to care about is the poltician or religious leader skimming off the top and having a fantastic life. Let alone that whatever side supports the powermonger are in fact supporting them in the lifestyle they are now accustomed too. Personally I consider myself a christian, but I do not go to church on the grounds the clergy are as corrupt as the polticians but the social beliefs of christianisty are in me so I need no church. That is more likely what it was like pre-christianity being made orthodox by the Romans centuries ago. The corruptive nature of those that would assume power is to sow the seeds of division. Got sucked into it once, seen it for what it was then walked away. Moray, sometimes it is surprising and enlightening to see “humanity” in action. The 3 ladies in Woolwich last week were a case in point. Not sure I would have had the same courage (would a man have been allowed I wonder?) in the face of such inhumanity! All orthordox religions seem to suffer from the same problem, controlling their flock and promoting their religion, is more important than promoting a faith. I’d put Catholics, Muslims, Orthordox Jews and Scientology into that box. I’m sure others could add many more! Christian organisations do much the same. Check out ‘The Passage’ in Westminster. You were not witnessing charity in the usual sense, more like ingratiating behaviour with a view to giving good PR. That you of all people should be taken in . . .
but as a former serving officer you will have already done so. Even more odd then that you speak as you do. Thanks Mike and you make a good point. I hadn’t really considered what I witnessed at the mosque as being ingratiating behaviour per se, but I understand why it could be viewed as that. I accept, of course, the prevalence of Christian charity and do indeed witness it all the time. 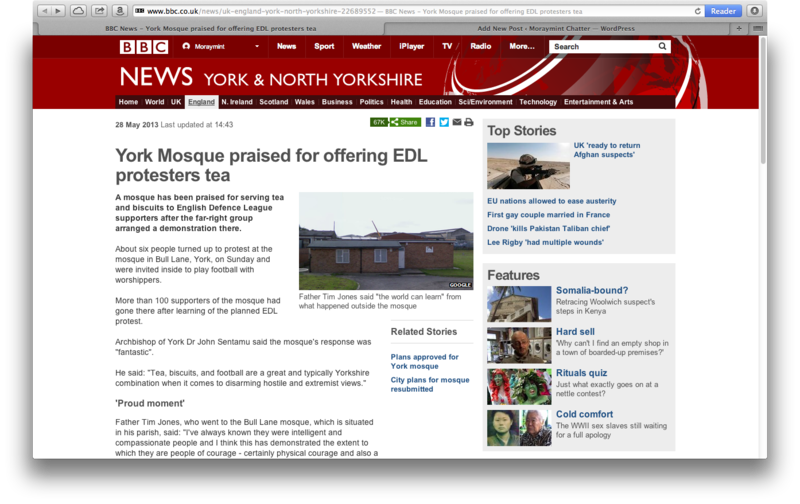 I published this post simply because the BBC report about the York mosque caught my eye and reminded me of my experience at Potterow. Perhaps these are just simple acts of ‘humanity’ – but, then, as an atheist I would probably argue that all acts of charity are simple acts of humanity. I’m sorry that you feel as you do. It’s possible to view all acts of charity as ‘ingratiating’, no matter who has shown the charity. 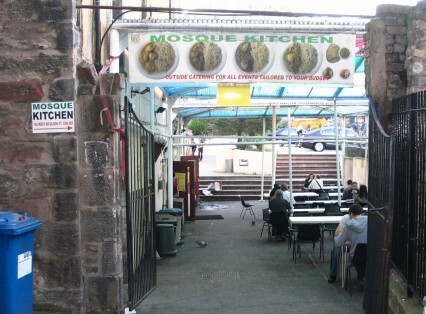 If this muslim kitchen has just changed its behavior in the last week or so, then yes, I would probably agree. But in general terms, this is just another instance of modern common sense. My modus operandi of ‘Don’t trust the b*st*rds’ until proven otherwise, has been extended from the usual politicians and estate agents to embrace anyone expecting trust. It is unfortunate to say that the people I have found untrustworthy have mainly been ‘professional’ – and Christian! I would say that I’m thinking on the same lines as you. I’m not impressed by CAFOD and the like. However, on broad balance it is Christian organisations that do charitable work worldwide and islamic ones that do it only for islamic beneficiaries. An interesting point Moraymint,all religeons have their nutters thats true.In some universities over here the same thing happens,perhaps we should wonder how they financially manage that as poor students.Taking you a step further. In a discussion with politician who visited my boss,she told us these “suplimented kitchens” are paid for by what is thought to be radical muslim societies through layers of innocent parties. The other eye opener was here in Germany is there are female school children who are forced to go to school wearing head scarves by their parents because the parent receives 100 euro per month to make sure they wear muslim headgear to school,paid for again by the same shadowy societies.